Galacticat is a regularly-updated black & white on-line comic story about a cat in space named Wallace… with a little bird named Elpy. It’s written by Gene Goldstein and illustrated by Kasey Williams — and the pair make regular appearances at various comic book and anime conventions. 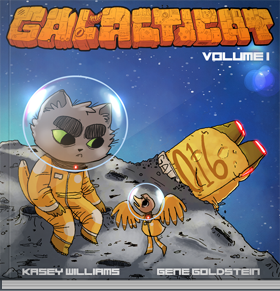 What’s more, the first 10 chapters of Galacticat have been collected in a pair of books, Volume 1 and Volume 2, available on both Amazon and Createspace. There’s information about ordering each of them on the Galacticat web site, as well as the latest pages of the story.